The threshold frequency of a metal refers to the frequency of light that will cause an electron to dislodge from that metal. Light below a metal's threshold frequency will not eject an electron. Light at the threshold frequency will dislodge the electron with no kinetic energy. Light above the threshold frequency will eject an electron with some kinetic energy. These trends are known as the photoelectric effect. The photoelectric effect describes the way in which the frequency of incident light determines whether an atom releases an electron. Heinrich Hertz originally observed this effect in 1886. These observations contrasted the hypothesis that the intensity of the light would directly correlate to whether a metal released an electron. Metals released electrons even with low-intensity light. Instead, increasing the intensity of the light increased the number of electrons emitted. Increasing the frequency gave the electrons more kinetic energy. Later, Albert Einstein helped to make sense of these observations. He theorized that light carries a different amount of energy based on its frequency, and that this energy is quantized in particles called photons. The threshold frequency is the frequency of light that carries enough energy to dislodge an electron from an atom. This energy is entirely consumed in the process (see References 5). Therefore, the electron gets no kinetic energy at the threshold frequency and it is not released from the atom. Instead, light must have slightly more energy than that which is present at the threshold frequency in order to give an electron kinetic energy. The work function is a way of describing the amount of energy given to an electron at the threshold frequency. The work function equals the threshold frequency times Planck's constant. Planck's constant is the proportionality constant that relates a photon's frequency to its energy. Therefore, the constant is required to convert between the two quantities. Planck's constant is equal to about 4.14 x 10^-15 electron volt-seconds. The units of the work function are electron volts. One electron volt is the energy needed to move an electron across a potential difference of one volt. 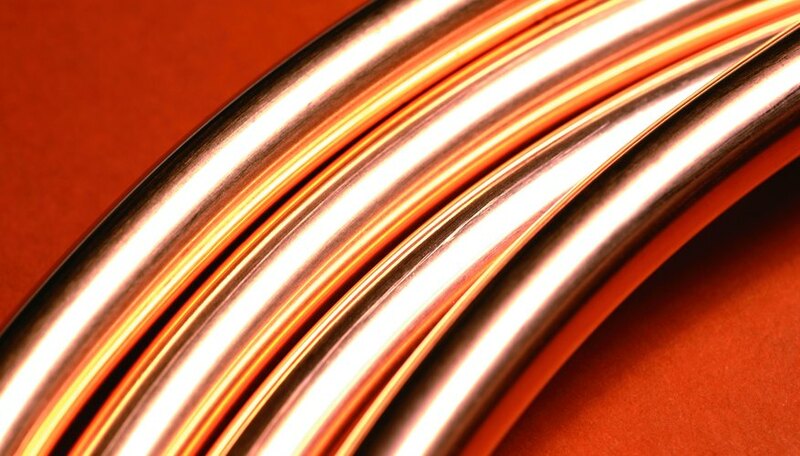 Different metals have characteristic work functions, and therefore characteristic threshold frequencies. For example, aluminum has a work function of 4.08 eV, whereas potassium has a work function of 2.3 eV. Some materials have a series of different work functions. This is due to the work function energy of a metal depending on the position of the electron in that metal. The precise shape of the surface of a metal will determine exactly where and how electrons move in the metal. Therefore, the threshold frequency and work function can vary. For example, the work function of silver can range from 3.0 to 4.75 eV. Murmson, Serm. "Threshold Frequency of Metals." Sciencing, https://sciencing.com/threshold-frequency-metals-10471.html. 25 April 2017.